“A Raisin in the Sun” is Lorraine Hansberry‘s 1959, semi-autobiographical, play about a black family trying to better their circumstances by buying a house in a lily-white Chicago neighborhood. They are visited by the neighborhood organization’s spokesman who tries to persuade them not to move in; he offers veiled references to what has happened to other “colored families” who have tried to buy into other white neighborhoods. He even offers to buy them out. The family remains resolute. As the curtain drops they are surrounded by boxes, preparing to move to their new house on Clybourne Street. In the ’50s, “blockbusting” was a hot issue at every economic level. White families who were the first in an area to sell to blacks were met with intense pressure from their neighbors. Blacks who bought into a white neighborhood were met with more than that. For example, at about the time of Hansberry’s drama, the singer Nat King Cole bought into Los Angeles’ tony Hancock Park only to be greeted by a dump-truck load of gravel blocking his circular driveway. Welcoming committees were not subtle or welcoming. Fame and fortune were no protection against bigotry. Bruce Norris‘ cleverly structured “Clybourne Park” takes up where Hansberry left off. The time is 1959, the white Stollers of Clybourne Park are surrounded by boxes in preparation for their move to the suburbs. Russ Stoller (Frank Wood) sits in his armchair, clearly depressed, dressed in his pajamas, giving monosyllabic answers to the excessive nervous chatter of his wife, Bev (Christina Kirk). She is being helped by her proper, and properly uniformed, black cleaning lady, Francine (Crystal A. Dickinson). For starters they are called on by their pastor, Jim (Brendan Griffin), whose visit has clearly been arranged by Bev in an effort to get Russ out of his depression. Next comes suited Karl (Jeremy Shamos) and his pregnant deaf wife Betsy (Annie Parisse). He is the same head of the neighborhood welcoming committee who failed at convincing the black family of “Raisin” not to move in. He now seems to virtually fall over his own shoelaces as he awkwardly tries to persuade the Stollers to rescind their sale. Russ is unmoved; Bev tries to get everyone to make nice; the pastor expects everything to be cured by prayer; Francine just wants to get away from the patronizing Bev. Bottom line? There goes the neighborhood. Betsy’s deafness is symbolic of the cluelessness of them all. Act II takes place in the same Clybourne Park living room, 50 years later. It is stripped bare, graffiti is on the back wall. Two couples, one black, one white, are sitting on temporary chairs; they are flanked by their self-absorbed advisors. The white couple has purchased the house in this close-to-downtown, now black, neighborhood. It is in terrible shape, presumably the area, too, is in bad shape, and though they profess great affection for the history and original charm of the neighborhood, they are scheduled to tear it down and build a new house, which, incidentally is out of scale. What starts out as an extremely civil exchange — the new couple professes their love for the new neighborhood, the black couple is concerned that the history of the neighborhood will be eclipsed — deteriorates into an ugly, racially tinged, scene. As in the movie “Carnage” (and Yasmina Reza’s stage play, “God of Carnage,” on which it is based) no one stays likable for very long. The tensions in “Clybourne” are racial, but the tensions also flow from the rifts within the couples themselves. “Clybourne Park” is not warm and cozy. If not for Norris’ tight dialogue and biting sense of humor, it would be nigh impossible to sit through this discomfiting work. Norris specializes in this style. Fifty years pass between the acts, but progress is only superficial. In his view liberals have no right to pat their own backs. For that matter, there is not a lot of reason to expect an end to the war between the sexes, either. Women’s liberation seems to have been more successful, but the results are equally ugly. And, by the way, homeowners organizations tend to the tyrannical. Norris touches all bases. Director Pam MacKinnon has cleverly cast this play. The actors of Act I become the characters of Act II, but not necessarily in corresponding parts. It underscores the message that the more things change, the more they stay the same. It is a fine showcase for the skilled actors. Unfortunately the semi-round stage of the Mark Taper does not match the proscenium style of MacKinnon’s staging. Sitting high, and at roughly 1:30 on the circle, it is hard not to remain detached from what is a well-crafted work that asks to be deeply involving. “Raisin in the Sun” played on audience guilt and tugged at the heartstrings. 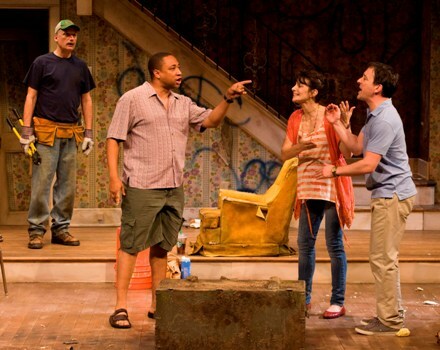 “Clybourne Park” leaves one wondering: will things ever change? It is a world-weary view. Buyer beware.